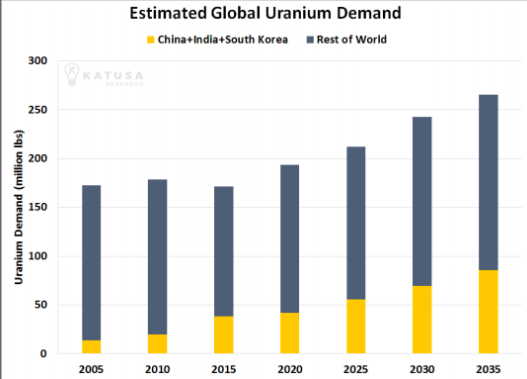 One Way To Play The Uranium Resurgence | Energy and Gold Ltd.
China’s nuclear plants will have a total generating capacity of nearly 60 million kilowatts by 2020 according to data from the National Energy Administration of China. During the recent bear market in uranium a lot of investors forgot about China’s commitment to nuclear energy. 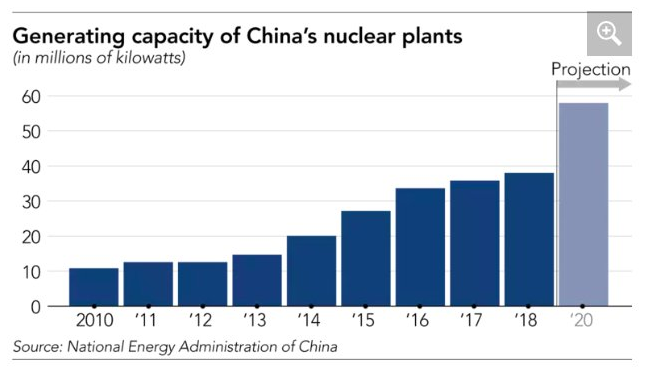 This Chinese commitment to nuclear energy as a major source of clean energy is finally turning the corner in terms of demand with a major acceleration in capacity occurring in the next two years. Everywhere one looks around the uranium sector suddenly there are positive signs and indications that the brutal multi-year bear market that began in 2011 has come to an end and a nascent bull market is emerging. There are many ways that an investor can play a bullish turn in the uranium sector, however, historically owning top-tier explorers with market caps below $50 million has delivered outstanding returns during the early stages of a bull market. As the uranium price began to break-out in 2005 we saw share prices of micro-cap uranium explorers surge higher, sometimes by more than 500% in a matter of a few weeks. These sorts of multi-hundred percent gains are far from unusual once a sector turns from being out-of-favor back to being in-favor with investors. Fear of missing out on big gains can quickly lead to stampedes that can generate violent rallies of as much as 1000% or more in once beaten down underpriced stocks. The situation in the uranium sector is ripe for just such a move with many uranium explorers with quality assets trading at extremely low valuations. These valuations don’t give the companies much credit for the chance of making a discovery or for the exploration work that they may have already completed on their projects. Not many uranium explorers can state that their shares are up several hundred percent over the last few years. Skyharbour can. Skyharbour is a discovery driven company that has assembled an impressive array of projects in the best jurisdiction for uranium exploration in the world, Canada’s Athabasca Basin. The company just completed a drilling program at its flagship Moore Project; Skyharbour originally planned 3,000 meters of drilling, but nearly 4,000 meters of diamond drilling was actually completed because Skyharbour geologists liked what they saw in some of the drill cores. Moore consists of 12 contiguous claims totalling 35,705 hectares and it is strategically located just east of the midpoint between the Key Lake mine and mill complex and Cameco’s McArthur River mine. Perhaps even more important is the fact that Moore has been the subject of extensive historic exploration with over $40 million in expenditures, and over 140,000 metres of diamond drilling completed in more than 375 drill holes. In addition, Skyharbour has intersected some extremely high-grade uranium in the “Maverick Zone” at Moore, including 4.03% eU3O8 over 10 meters, including 20% eU3O8 over 1.4 meters and 5.14% U3O8 over 6.2 meters. To put these outstanding intercepts into perspective, 4% uranium over 10 meters is roughly equivalent to 80g/t gold over 10 meters. When was the last time you saw a gold explorer drill a hole with 800 gram-meters gold? Yeah, it’s probably been a while! In addition to the Maverick Zone, diamond drilling in several other geophysical target areas at Moore has intersected multiple conductors associated with significant structural disruption, strong alteration and anomalous uranium and pathfinder element concentrations. Simply put, this is a good geologic recipe that bodes well for the possibility of discovering additional high grade uranium zones in these areas. 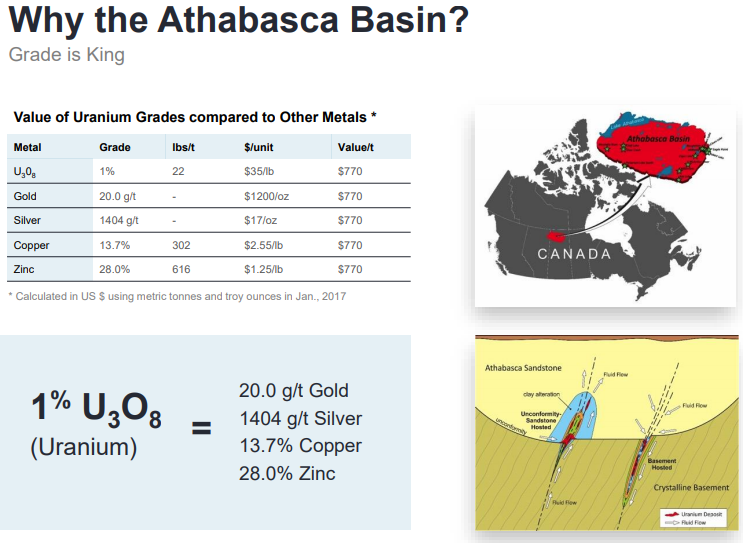 Skyharbour has a total of 5 projects in the Athabasca Basin with Moore being the flagship project. However, the company’s strategic partner Orano (formerly AREVA) recently announced a C$2.2 million exploration budget at Skyharbour’s Preston Uranium Project which is not far from NexGen’s Arrow Project in the Athabasca Basin. Through this partnership with Orano Skyharbour leverages its prospect generator model and benefits from an exploration program fully funded by Orano; Orano plans 4,850 meters of diamond drilling (15-20 holes) and geophysics at Preston to commence in early 2019. Orano may earn up to a 70% interest in the 49,635-hectare Preston project through $8,000,000 of total project consideration over six years, including up to $7,300,000 of exploration work programs and $700,000 of cash payments. It’s a testament to the quality of Skyharbour’s projects that one of the world’s largest nuclear power companies is willing to spend up to C$8 million in order to acquire 70% of one of Skyharbour’s “non-core” projects. I would assert that at its current C$32 million market cap Skyharbour shares don’t even fully value the flagship Moore Project, let alone the rest of Skyharbour’s project portfolio (Falcon Point, Preston, Mann Lake, and Yurchison). As the cycle continues to turn and the uranium bull market gets fully underway I expect the market to further appreciate the value embedded within Skyharbour’s project portfolio. I’m not afraid to say that I anticipate at least a double from SYH’s current C$.50 share price by the end of Q1 2019. Disclosure: Author is long shares of Skyharbour Resources (SYH.V) at the time of publishing. The article is for informational purposes only and is neither a solicitation for the purchase of securities nor an offer of securities. Readers of the article are expressly cautioned to seek the advice of a registered investment advisor and other professional advisors, as applicable, regarding the appropriateness of investing in any securities or any investment strategies, including those discussed above. Skyharbour Resources Ltd. is a high-risk venture stock and not suitable for most investors. Consult Skyharbour Resources Ltd.’s SEDAR profile for important risk disclosures. EnergyandGold has been compensated for marketing & promotional services by Skyharbour Resources Ltd. so some of EnergyandGold.com’s coverage could be biased. EnergyandGold.com, EnergyandGold Publishing LTD, its writers and principals are not registered investment advisors and advice you to do your own due diligence with a licensed investment advisor prior to making any investment decisions.